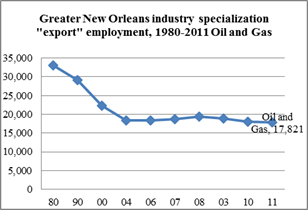 The new economic drivers of the New Orleans economy are not what you think. New Orleans transitioned from an oil based economy to a tourism based economy starting in the 1980’s, with the development of the convention center and continued through the next century with an explosion bigger than Norco in growth of new restaurants after Hurricane Katrina in 2005. The transition away from oil leaves one last economic driver related to the oil industry: the petrochemical industry which is currently undergoing continuous repair and expansion. The corridor between Baton Rouge and New Orleans is one of only a handful of areas in the United States with refineries, and this article examines their impact on the New Orleans Metropolitan Statistical Area (MSA). 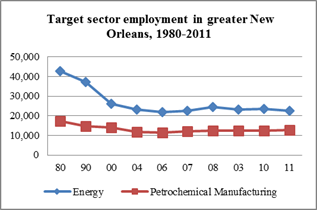 The Greater New Orleans (GNO) area, made up of ten parishes, provides a strategic location for petrochemical industries and is complemented by strengths in trade, logistics, and distribution capabilities. Recently over $6.4 billion dollars has been invested for the expansion and renovation of petrochemical plants, generating hundreds of jobs and significant income for the region. The petrochemical industry has gained considerable strength due to low prices in natural gas and high prices of oil per barrel, which is seven times the price of natural gas per million British thermal units (MMBTUs). Today, natural gas is roughly $3 per MMBTUs while oil is about $90 per MMBTUs, a ratio of 30 to 1. These abundant and less volatile prices of natural gas supplies are leading to a renaissance of manufacturing and industrial activity, particularly in Louisiana. Several expansion projects have been approved for refineries in the area. In April of 2013, Dyno Nobel Americas and Cornerstone Chemical announced a combined investment of $1.025 billion for a new ammonia production facility and related upgrades in Waggaman. Incitec Pivot Ltd., the Australia-based parent company of Dyno Nobel, will invest $850 million to build the ammonia plant, providing a commercial foundation for Cornerstone to continue its planned investment of $175 million in maintenance, upgrades and infrastructure expansion at its site over a six year period. In February of 2013, South Louisiana Methanol and Todd Corporation Group announced an investment of $1.3 billion in a new methanol production facility in St. James Parish. These investments will enable the plant to process additional heavy feed-stocks, increase throughput capacity, upgrade its product yields and improve on-stream reliability. Valero has invested over $1.5 billion into the Norco refinery in St. Charles Parish and Marathon Petroleum Company has just complete a massive expansion in 2013 making it the fourth largest refinery in the United States. Industrial construction in the petrochemical and oil and gas industries will drive strong employment gains in Southeastern Louisiana over the next few years. Finally, the GNO area offers a lower cost of doing business compared to the rest of the nation as well as incentives designed to attract businesses and companies. These include tax credits, material rebates, deferred property tax assessments and contract lending. These incentives coupled with a well-equipped, educated workforce make the GNO region highly attractive and poised to move forward in the future. Oritz, E., & A. Plyer. (2013). Economic Synergies Across Southeast Louisiana. New Orleans: Greater New Orleans Community Data Center. Scott, Loren C. (2011). The Economic Impact of the Haynesville Shale on the Louisiana Economy: 2009 Analysis and Projections for 2010-2014.